Kat Odell: Hi, my name is Kat Odell, and my new book just came out, it's called Day Drinking, and it's 50 Cocktails for a Mellow Buzz. Suzy Chase: You're a long time contributing editor for eater.com, and you've written for vogue.com, T the New York Times' style magazine, Bon Apetit, Conde Nast Traveler, Food and Wine, Tasting Table, elledecor.com, Food Network Magazine, and many more. And if that's not enough, you have a new book out called Day Drinking. Tell us about Day Drinking. Kat Odell: Day Drinking is a collection of recipes from some of the top bartenders in the U.S. and a couple abroad in London, and it's recipes that celebrate low alcohol drinks. So, instead of basing recipes on full-proof spirits, like traditional cocktails, Day Drinking embraces beer and wine and other alcohols like sherry, vermouth, and amaro. So, rather than having a cocktail which has maybe one and a half to two shots of liquor, and sometimes even more, this has about half a shot. Some of the cocktails do use full proof spirits, but significantly less than you would use in a cocktail. Suzy Chase: So, if a cocktail's lower in alcohol, should we assume that it's less calories, too? Kat Odell: So here's the thing, if you're looking at the amount of calories in liquor based on percentage of alcohol, or the alcohol percentage in the alcohol, yes, the fewer the calories. However, end of the day, it's really about the other ingredients in the drink as well. So, you can have a drink that has a lower proofed spirit, but if you're putting extra sugar in, or extra fruit, it can technically have more calories, so not necessarily. But if you're looking specifically just at the booze component, then yes, that would be true. Suzy Chase: Do these cocktail pair better with food? Kat Odell: I think so. From my own experience, I've had so many tasting menus that pair, you know, of course, wine and different beverages, now the evolution of the beverage pairing isn't necessarily restricted to wine. But from my experience, when you're drinking a full-proof spirit, it kind of blasts out your taste buds and you can't really try the food as well. So, in my personal opinion I do think that lower proof cocktails do pair better with food. Suzy Chase: You grew up in American with European parents. How did that influence your ideas about drinking? Kat Odell: Food and wine has always been really important for my parents, and that's something that they installed in myself and my brother at a really young age. I started drinking wine when I was, maybe not drinking, I shouldn't say drinking, but I started tasting wine probably when I was about ten years old, just because my Dad likes to say develop a pallette. My parents just they have an affinity for food and beverages as well, so that impacted me as far as alcohol was never contraband, so I was never the kid that was out necessarily getting so drunk, you know, they sort of can't make it home and they get in trouble with their parents. And then, beyond that, I think because alcohol was never a big deal in my family and it wasn't really a restricted drink by any means, even when I was under twenty-one, I sort of appreciated the flavor of, let's say, wine, as opposed to the idea of just drinking to get drunk. That's something that I've always considered and something that for somebody that loves food as much as I do, the flavor is just as ... For me actually, it's far more important than straight up getting drunk. Suzy Chase: What's the different between a session, and a low ABV, alcohol by volume, cocktail? Kat Odell: So session drinks, you can look to session beers, that's a term that was started for beer that was lower in alcohol. The idea being that you could drink more in a session, so you could apply the exact same idea to cocktails. The thing with drinks that you can drink, you can drink more cocktails in a shorter span of time, session beers, session cocktails, exactly the same idea. Suzy Chase: I've noticed a shift on cocktail menus to include lower proof selections. Kat Odell: As far as cocktail culture, we're living in a world that's far more sophisticated in terms of drinks, and bartenders are trying to be creative, beyond traditional full proof spirits: vodka, gin, whiskey. And I think that lower proof alcohol liquors, which are now more than ever available in the U.S., if you look to, let's say, Italy, you have more Amari, you have more aperitif wines, so we have more product available in the country, and recently available too. And because there are more of these bottle that bartenders now have access to, they're able to get creative with drinks in new ways. And I think that that is largely leading to a lot more lower proof drinks. Something that I've personally noticed as a restaurant editor, is that back in 2013, so I was the editor of Eater L.A. for a long time, and one of the first places in Los Angeles that I remember stumbling upon low alcohol drinks was at a place in Venice called Salt Air, and they didn't have, the owners of that didn't have a full liquor license, so they were able to legally sell beer and wine. And rather than just offering beer and wine, Brian Butler, who developed their cocktail program, wanted to, he's incredibly talented behind the bar, and he wanted to offer something a little bit different. And I remember walking into that restaurant before it opened, and he tasted me on a bunch of his cocktails that he had based on beer and wine, and they were just incredible and delicious, and I was so impressed. And that was one of the first restaurant where I had first tried like a proper low alcohol drink that wasn't a mimosa or a michelada, which are low alcohol drinks that have been around for a long time. And then from there, a restaurant also in L.A., in Santa Monica, called Farmshop. When they first opened, they didn't have a full liquor license, and they started off with beer and wine. And thee I had this really wonderful French aperitif cocktail that was based on chilled Pinot Noir, and cassis syrup, also so incredible. And since then the trend has really grown, there's buyers now in New York that have entire cocktail programs devoted to low ABV, so I just think that there's so many instances when people would want to be drinking cocktails that have less alcohol, more so for flavor, than about getting totally toasted. And I think largely the sophistication of the cocktail movement and the access to more of the lower alcohol spirits is really helping. Suzy Chase: What are the main typed of alcohol that we can find in low ABV cocktails? Kat Odell: You can find full proof spirits, you can find vodka, gin, whiskey; but when you're using those, you're gonna use a lot less. So I have, for example, a cocktail in my book that calls for half an ounce of whiskey, as opposed to a traditional cocktail, which would probably call for somewhere between one and a half ounces to two ounces. But for the most part, you find beer and wine based drinks, and then beyond those two, you would find, I'm at least noticing as far as trends, I've seen a lot of vermouth, other aperitif wines, and then amari. So, there's so many more amari available in the U.S. than there ever have been, and I think the bitter flavor profile lends well to cocktails and so it just offers bartenders another option to play around with and get creative. Suzy Chase: When you're making a cocktail, what are your easy go-to garnishes? Kat Odell: You know, I use a lot of, I have a lot of, I'm working on this other book called Unicorn Food, and I have so many different play-around garnishes. I have a ton of dry flower petals, I sometimes use that. One of my actual favorites for a champagne cocktail, I get this hibiscus, they're basically candied hibiscus flowers in this really pretty pink syrup, and I like to take a coupe glass, fill it with champagne, add one of these hibiscus flowers, and it just basically floats in the champagne and it's so pretty. Beyond that, I think in terms of garnishes, they should always tie into the cocktail, you shouldn't just have something that's completely random, so whenever I'm making fresh fruit cocktails at home, I try to be creative with whatever fruit is already in the drink, and use that as a garnish in some way. Suzy Chase: Where can we get those hibiscus flowers? Kat Odell: They're sold online for sure, and then I also believe, I don't think Williams-Sonoma has them, maybe Sur La Table gets them, but you can definitely get them online, and I'm pretty sure Amazon has them. Suzy Chase: Now, I'm dying to hear about your trip to Mexico, in particular, Noma. Tell us about some of your meals and drinks at Noma Mexico, but first, did you read Pete Wells last week in the New York Times? Suzy Chase: That said he's refusing to review it. Kat Odell: His non-review of the review. Suzy Chase: It was the best review of all time. Kat Odell: I understand the point he was trying to make. As a reviewer you are trying to provide an opinion on a restaurant, in the hopes or the assumption that others will go and dine there, and you can't really get in to Noma Mexico. I think, I also think that Rene is such an important chef and he's gonna continue to have pop-ups around the world, and of course Noma's gonna reopen, so just having an opinion on what was happening in Tulum is worthwhile. I enjoyed my meal a lot, I love Tulum, I love the jungle. It was really great to have such inspired cuisine in the middle of nowhere. Personally I feel that my meal at Noma in Copenhagen was better, but given the limited time, given the fact that they built an entire kitchen in the jungle, and the ingredients, it was really impressive and super creative, really innovative, and overall I was quite impressed with the meal. Suzy Chase: Did you find any cocktails that you had never heard of or tasted before? Kat Odell: There was this like green tomato mezcal that they served. I actually didn't so much care for the beverage pairing for that meal, that was probably my least favorite part. Whenever I'm in mexico I drink a ton of mezcal just because I love mezcal, so it's always for me finding new varietals that I haven't tried, and my go to cocktail is usually a salty mezcal margarita with very little sugar. So I drank a lot of those when I was out there. Suzy Chase: Do you think the craft cocktail world is over saturated at this point? Kat Odell: There's so many bartenders that take themselves so seriously, I'm over the stuffiness that's associated with the cocktail world. And I don't know, for me, I wish that there was less sugar in cocktails, I think that drinks for the most part are overly sweetened. And for example, in Mexico, when you have such great access to produce and seasonal, and ingredients that are at their peak of ripeness there's really no need to add extra sugar to those drinks, and so I find myself at bars for the most part just asking for whatever the cocktail is minus any simple syrup or agave. End of the day I love cocktails, and so I'm excited to see, as the culinary world progresses and as the drink world progresses, I'm always keen to see what happens, and I also love discovering, whether it's new spirits or applications of spirits, more product that we get available in the U.S. So it's always interesting for me to see what's happening, and that's also why I travel so much, I love to experience food and beverages in other parts of the world, and it's an opportunity to learn about the other ways that people apply ingredients, and just other ingredients that are available in other parts of the world. Suzy Chase: On pages 58 and 59, you're pictured at Tacombi on Bleecker Street in New York City, down the street from me, where I tried out their michelada. Which was actually more like a michelada negra because they used dark beer. So describe a michelada for us. Kat Odell: A michelada is a beer based cocktail, in Mexico you'll add tajin, which is sort of this like chili spice mixer. I personally love a salty michelada with a lot of lime juice, I really like a lot of acidity, with tomato. There's so many ingredients that you can really add to a michelada, I love umami, so I like adding tomato, or I've had dashi, like a tomato dashi added to a michelada. A fun kind of like hack that you can do at home, if you want to make a michelada is beer with salsa, pop it in your blender, and then top it off with a little more beer. But in general my pallette seeks savory, certainly for cocktails, and so michelada's definitely one of my favorites, and heavy on the acid. Love lots of lime juice. Suzy Chase: I brought the book with me, and the waiter took it around and showed everyone, they all went crazy. Kat Odell: Oh my god, cute. I love that. Suzy Chase: They were like, I remember this photo shoot. Kat Odell: Aah, yay. That was a perfect venue, it worked out so well, and a bunch of my best friends were all at that shoot, so it was great. Suzy Chase: So your next cookbook, is going to be called Unicorn Food. Can we get a little preview? Kat Odell: Definitely. So, Unicorn Food is plant based recipes devoid of sugar and gluten. For me it was since I'd been living in Los Angeles for a long time, and moving back to New York, and not having access to a lot of the clean, healthy foods that were readily accessible in L.A. so I couldn't really find anything in New York. So I just took it upon myself to just start making all these different foods at home, and I end up eating so much restaurant food for my job and it's really balance at the end of the day. So when I'm out traveling and I'm at a restaurant, I'm at home and I basically just eat vegetables. That is really what inspired Unicorn Food, and I'm a very visual person and I have an art background, I was an art history major in college, and so color is always really important to me. In the foods that I'm creating, color serves a purpose, it's not just adding a color to a dish necessarily, but there has to be a function with the flavor, and also the nutritional value, so colored food is so much more healthful than white food. So that's also why I look to color in creating dishes. So yeah, I'm really really excited about that book. It'll be out in about a year. Suzy Chase: Yeah, I was just gonna ask when is it gonna come out. So, 2018? Kat Odell: Yes, spring 2018 it's slated to be published, to be released. Kat Odell: kat_odell on Instagram and Twitter and Facebook. Suzy Chase: I think we should all get a mellow buzz. Thanks Kat for coming on Cookery by the Book Podcast. Kat Odell: Thank you so much for having me. Suzy Chase: Subscribe in iTunes, and follow me on Instagram at cookerbythecook, on twitter at iamsuzychase. 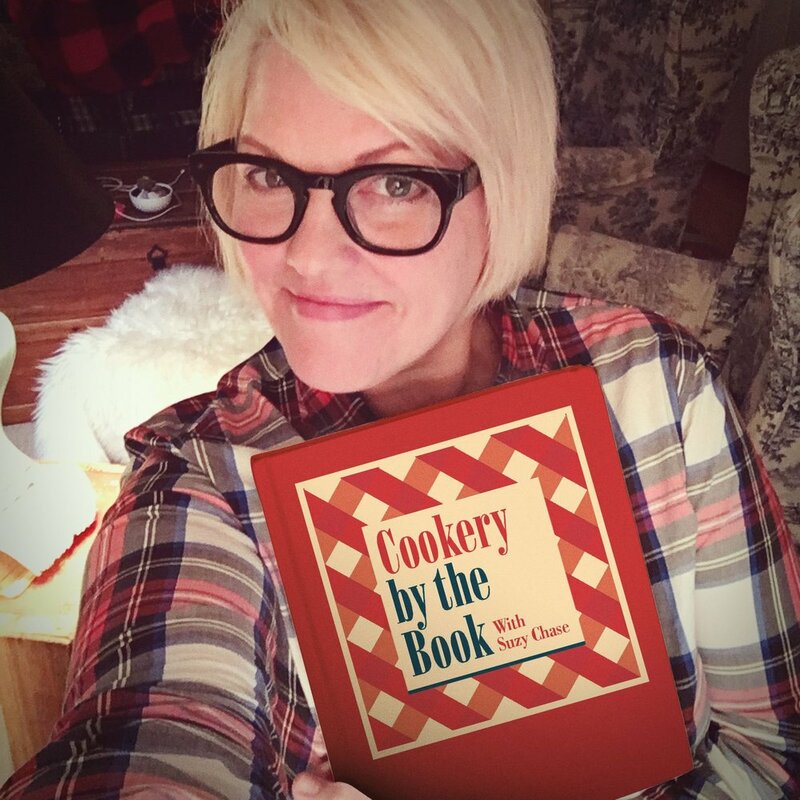 Thank you so much for listening to Cookery by the Book Podcast.